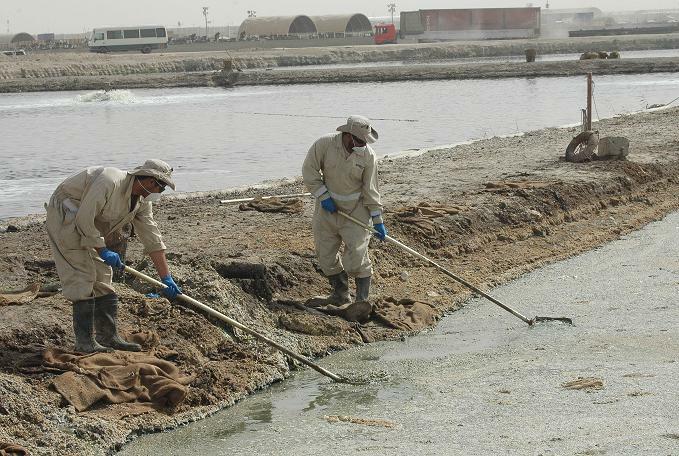 Employees of ATCO Frontec Europe skim Kandahar Airfield’s Poo Pond on Sept. 13. Poo Pond is being drained and all evidence of the infamous pond promises to be gone by April 2013. Photo by Sgt. 1st Class Erick Studenicka, 117 Mobile Public Affairs Detachment. The sea of human waste at Kandahar Air Field known as the “Poo Pond” is finally being drained! “By early winter, most of the pond area near the intersection of All-American Boulevard and Louisiana Road promises to appear just like any other non-descript vacant plot of land on KAF,” a triumphant news release announced on Thursday. The process of exorcising the Aegean Sea of excrement began on Sept. 3, when sewage suction trucks began using the new Deep South Water Waste Water Treatment Plant, the news release says. The next day, black water from three of the Poo Pond’s cells started being transferred to the new wastewater facility, which will be fully operational by Oct. 1. The last of the infamous Poo Pond’s visible cells will be drained in January because it contains kitchen grease and other materials that require special disposal. Each cell will need three to four weeks to dry, after which the remaining sludge will be removed and the dried sub ponds can be backfilled. “Newcomers to KAF in April 2013 will have no idea the Poo Pond was ever here and they’ll have no idea what the pond ever looked like,” said a NATO spokesperson in the news release. But the Poo Pond has earned a hallowed place in the annals of war and will never be forgotten.